The Syrian opposition’s High Negotiations Committee (HNC) discussed in detail the question of a transitional governing body during their first meeting with the UN special envoy for Syria Staffan de Mistura, head of the HNC delegation Nasr Hariri in Geneva said on Friday. “We have concluded fruitful discussions with Mr. Staffan de Mistura. We proceeded from the progress, achieved at the end of the previous round especially on the issue of political transition. We elaborated more on the transitional governing body and its structure as well as on all transitional institutions, related to the governing body during the transitional period,” Hariri told reporters. The HNC handed to de Mistura a report on the humanitarian situation in Syria. At least 586 people had been killed across Syria between the two rounds of negotiations. Regime forces and their allies targeted at least nine schools, several medical facilities, and five public markets. The Assad regime arbitrarily arrested 647 people, including 24 children and 43 women, Hariri said. “We are here to rid our country of terrorism. However, in order to liberate the country from ISIS, we should first free it from the state terrorism being practiced by the Assad regime,” Hariri stressed. The HNC’s chief negotiator Mohamed Sabra said that the HNC delegation handed to the UN envoy a paper outlining the opposition’s vision for the transitional governing body. The paper demanded that powers to be exercised by the body should include the powers of the president and the government, including authority over the army and security apparatus. Dr Izzeldin Abuelaish is suing the Israeli government after his three daughters and niece were killed at close-range by an Israeli tank during Operation Cast Lead in 2009. It was a dreary evening on 16 January 2009 as Operation Cast Lead – which rocked the Gaza Strip for almost three weeks – was nearing its end, when an Israeli tank rolled up outside Dr Izzeldin Abuelaish’s home. The next thing he knew, three of his daughters and his niece were in pieces – dead. Now, almost a decade after tank fire took the lives of his daughters – Bessan, 13, Mayar, 15, and Aya, 20 – as well as his 14-year-old niece Noor, an Israeli court has heard Abuelaish’s testimony. Abuelaish felt compelled to file a lawsuit against the State of Israel six years ago, after the Israelis refused to admit its liability and offered a formal apology. At the time of the shelling, Abuelaish worked as an infertility specialist at Tel Hashomer hospital, one of Israel’s main hospitals. As a gynaecologist who worked in several Israeli hospitals, he knew many Israelis, including a reporter working for Israel’s Channel 10. The reporter, Shlomi Eldar, would phone Abuelaish regularly to describe the situation in Gaza from the ground, given that the Israeli government allowed no Israeli journalists to enter Gaza to report. Two days before the death of his daughters, an Israeli tank approached his home and directed its main gun towards it. A frenzied Abuelaish called Eldar who then phoned the Israeli army to notify them that the house belonged to the doctor. “They didn’t find any fighting or militants near my house, and they moved on,” Abuelaish said. This did not stop them from firing at the house two days later. Abuelaish’s heart-wrenching reaction in the aftermath of the shelling gained worldwide attention as it was broadcast live on Israeli TV through Eldar’s phone. During Israel’s 2008-2009 Cast Lead offensive in Gaza, 1,268 people were killed in the besieged territory, among them 288 children and 103 women. They are human beings. They have faces. They have names. In order to launch his lawsuit, Abuelaish had to post a financial bond of 20,000 New Israeli Shekels (NIS) for each of his daughters and his niece. “I was obliged to post a bond of 80,000 NIS to pursue this,” he told MEMO, the equivalent of $22,000. I am accountable to my daughters and I will never give up as long as I am breathing. They deserve justice. Abuelaish is in a better position than other Palestinians in Gaza who have lost innocent loved ones to Israeli bombardment and shelling. Besides the access to contacts that he has after having worked in Israel, he is also financially more able to pursue a legal claim. Abuelaish says this is going to be a long legal battle, but he is patient and will not give up. They have to understand that patience, resilience, tolerance and kindness are not signs of weakness. They are signs of courage, and we Palestinians have been patient for a long time. Abuelaish’s wife was spared the pain of the tragic loss, having passed away from leukaemia a few months before the war kicked off. After the war, Abuelaish moved with the surviving members of his family, three daughters and two sons, to Canada after having been offered a job as a Professor of Medicine at the University of Toronto, a post he still holds. There, he established a charitable foundation, Daughters for Life, which supports the education of girls from the Middle East. Whatever damages the courts may afford him – provided he wins the case – will go towards furthering the charity’s goals and supporting young women across the Middle East. I would love to go to Gaza and visit my daughters’ graves and tell them you are alive and you are with me. You didn’t die. You will never die as long as I am breathing and I didn’t give up. I am not broken. I am not defeated. Israeli police have refused to grant a permit for the annual March of Return, this year, organized by Palestinians to commemorate the Nakba, or “catastrophe,” alongside Israeli Independence Day, Israeli media has reported. The march, which has been held for 18 consecutive years, is aimed at highlighting the internationally-recognized right of Palestinians who remain refugees or internally displaced to return to their homes and villages in Israel, a right which is upheld in United Nations Resolution 194. Each year, the march is launched from a site of a Palestinian village destroyed by Israeli forces in 1948, Ma’an News Agency reports. Muhammad Bassam, an attorney from the Israeli rights group Adalah, reportedly said that if the permit for the march was not granted by Israeli police, the group would appeal to Israel’s Supreme Court. “The police decision is very strange and raises concerns that the refusal to approve the event is politically motivated,” he said. Others pointed out to Haaretz that the organizers had already discussed the march with local police in the Israeli coastal city of Nahariya, in order to launch the march from the destroyed Palestinian village of al-Kabri. The Nahariya police had toured the planned route of the march two weeks prior, Haaretz reported, with the police already setting the police requirements for the march, leading some to suspect that the permit rejection was politically motivated. The March of Return is usually held on Israeli Independence Day to commemorate the Nakba, referring to the mass expulsion of Palestinians from their homes and villages during the 1948 Arab-Israeli war that established the state of Israel. The official commemoration of the Nakba is held on May 15th, and is observed by millions of Palestinians and rights activists around the world. Some 750,000 Palestinians were expelled from their lands in 1948 and were scattered across refugee camps in the occupied West Bank, the Gaza Strip, Jordan, Lebanon, and Syria, according to the United Nations Relief and Works Agency (UNRWA). Today, there are over five million Palestinian refugees who remain displaced from their original homes and villages, following the mass expulsion that occurred almost 70 years ago. Israeli Occupation Forces (IOF) arrested Friday evening the Palestinian ex-detainee Usaid al-Werdiyan, 23, from Bethlehem, while passing through a makeshift barrier one month after his release from the Palestinian Authority (PA) jails. The PIC reporter revealed that captive Werdiyan had a heart attack a month ago while he was detained in jail by the PA intelligence apparatus in Bethlehem city. He is still under treatment during which a heart rate monitor battery was going to be installed in his chest, the reporter added. Werdiyan, the son of the Hamas leader Hassan al-Werdiyan, is an ex-detainee who served several years in Israeli jails. He was also detained more than once as a political captive in the PA jails because of his involvement in activities with the students’ Islamic bloc in a university in Bethlehem. BETHLEHEM (Ma’an) — After two Palestinians were killed and at least four others were injured in clashes in Lebanon’s Ain al-Hilweh refugee camp between Thursday and Friday, renewed violence Friday evening left another Palestinian dead. Lebanon’s National News Agency (NNA) reported that Palestinian refugee Ibrahim Hussein died of wounds he sustained during an armed “personal dispute” in the Jabal-al-Halib area inside the camp. Members of the Fatah movement later reportedly caught the perpetrator, identified by NNA as Jihad Abdul Mohti, and handed him over to Lebanese army intelligence authorities. Saturday morning, NNA reported that the security situation Ain al-Hilweh remained tense, and that all social, educational, and medical institutions associated with UNRWA were closed for business, as streets were empty and citizens apprehensive of sniper fire. Late last month, armed violence in the refugee camp left an 18- and 12-year-old Palestinian dead, while at least eight others were injured — including a pregnant woman. The violence was strongly condemned by UNICEF and UNRWA, the UN agency responsible for providing services to some five million Palestinian refugees. A spike in armed violence between Fatah supporters and Islamist groups in Ain al-Hilweh in December left two dead and at least five injured, with UNRWA suspending its operations in the camp as a result. The largest and most crowded refugee camp in Lebanon, Ain al-Hilweh is home to some 54,116 registered refugees who fled their villages during the establishment of the state of Israel in 1948, according to the UN. 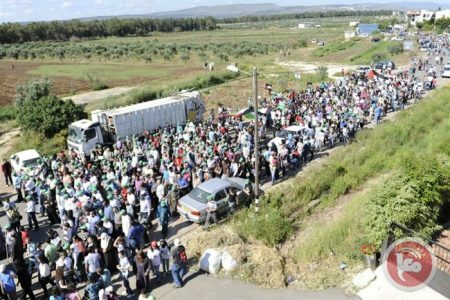 However, the population has significantly increased since 2011 as a result of the Syrian war, as Palestinians have been displaced a second time from refugee camps across Syria, with development nonprofit organization Anera estimating the camp’s population to be closer to 120,000. According to UNRWA, Ain al-Hilweh suffers from high rates of poverty and poor housing conditions, which have been further stressed as a result of overcrowding in recent years. Palestinians in Lebanon have the highest percentage of their population living in abject poverty from among the other countries the organization serves, according to UNRWA. Facing discriminatory employment policies, Palestinians in Lebanon are restricted from working in over 20 professions or claiming the same rights as other non-citizens in Lebanon, while all the refugee camps suffer from overcrowding, poor housing conditions, and a lack of infrastructure. BETHLEHEM (Ma’an) — Israeli police arrested four Israelis after they were accused of stabbing and seriously wounding a 19-year-old Palestinian Friday evening, according to an Israeli police spokeswoman, who claimed initial investigations indicated that the attack had criminal motives. Luba al-Samri said in a statement that the “Arab” victim was stabbed on the street in his hometown of Nahariya in northern Israel, and that four “Jewish suspects,” which included a teenager and three others between 20 and 45 years old, were being interrogated for their involvement in the attack. The Palestinian, who remained unidentified, was evacuated to the hospital for treatment of serious injuries, al-Samri said. Israeli police were expected to request to extend the remand of the four suspects on Saturday for further invitation in the case that al-Samri said “seemed to be purely criminal,” without elaborating. Anti-Palestinian attacks in Israel are frequent, with activists and rights groups having denounced a “culture of impunity” for Israelis committing violent acts against Palestinians. In a statement, Hezbollah said that Israel’s hostile spirit is evident in the crime and stressed the inevitability of the continuation of the fight against the enemy till expelling it from “our occupied land”. Al-Qassam commander Mazen Fuqaha, who was freed in a 2011 prisoner swap deal, was assassinated on Friday evening with four bullets in his head. Fuqaha was released along with more than 1,000 other Palestinian prisoners in exchange for the Israeli soldier Gilad Shalit. Dozens of Palestinian homes have become threatened with demolition as the Israeli municipal authority in Occupied Jerusalem is still embarking on building a link road passing through the Palestinian neighborhood of Jabal Mukaber. Lawyer Ra’ed Bashir, a member of the Jabal Mukaber land defense committee, told the Palestinian Information Center (PIC) that the road, to be named the American Street, would be 32 meters wide, thus leading to the demolition of 57 Palestinian homes. Bashir added that the Israeli municipality would not build new homes for the Palestinians whose current ones are slated for demolition to make space for the new road and would only allow commercial structures and projects to be built around it. He noted that Jabal Mukaber land defense committee managed to extract a court order delaying the demolition of 35 homes for five years, but the Israeli occupation authority did not comply and decided to go ahead with the road project. He also said that the residents of the neighborhood only want the IOA to make the road 12 meters wide instead of 32 meters, to provide their area with infrastructure, and to allow residential construction around it. Although the Israeli municipality claims that the road project is intended to serve the Palestinian residents, specialists in Jerusalem affairs confirm that the facts on the ground reflect that it will be built to connect the settlement of Har Homa (Jabal Abu Ghneim), south of Jerusalem, with the settlement of Ma’ale Adumim, east of the city. The head of the Syrian opposition delegation at peace talks in Geneva stressed their commitment to a “political solution” yesterday. UN Special Envoy for Syria Staffan de Mistura met delegates from the Syrian regime of Bashar Al-Assad, headed by his envoy Bashar Al-Ja’afari, and representatives of the opposition, led by Nasr Al-Hariri. We are here to remove terrorism from our country. However, in order to liberate the country from Daesh, we should first liberate it from the [Assad] regime’s state terrorism. The two had “a positive and fruitful meeting,” Al-Hariri said, adding they mainly discussed a transitional government in Syria. “We are still committed to a political solution,” he said. The last round of talks on Syria began on 23 February and ended on 4 March without any clear result. De Mistura said he did not expect a miracle or a milestone this time but added that negotiations with representatives of the regime and opposition would continue today. Before leaving for Geneva to attend Syria peace talks, de Mistura had met with Turkey’s Foreign Ministry Undersecretary Umit Yalcin in Ankara and Russian Foreign Minister Sergey Lavrov in Moscow. The Moroccan Commission for the Support of the Nation’s Issues declared Saturday a national campaign to support the Palestinian People and a series of events commemorating the Palestinian Land Day and the Balfour Declaration. “The campaign aims to renew our support to our brothers in Palestine and our total condemnation of Israeli inhuman crimes,” the statement added. The events include workshops, seminars, lectures, photo galleries, and sit-ins. On March 29, a national festival will be held at the University of Moulay Ismail in Meknes in coordination with the National Union of Moroccan Students. A popular march will be also organized on March 30 to mark the Palestinian Land Day in Rabat city.